Home Costs > How Much Does Tempered Glass Cost? How Much Does Tempered Glass Cost? Tempered glass, often referred to as toughened glass, is a type of safety glass that is treated with heat or chemicals to increase its strength compared to normal glass. If tempered glass is broken, it will not break into sharp shards of glass; instead, tempered glass shatters into smaller granules. 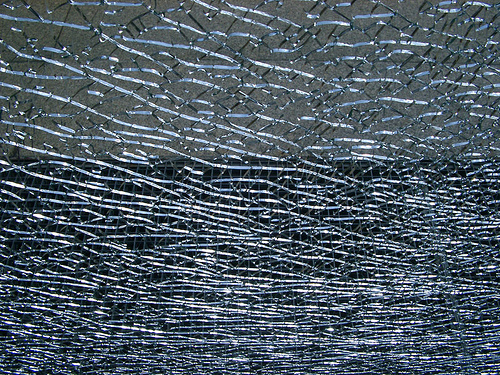 These chunks of glass are less likely to cause injury when compared to the traditional glass that breaks into larger shards. Tempered glass is commonly used in automobiles and cellphone screens, but it can also be used inside a home or commercial buildings. The price of tempered glass will depend on the company manufacturing it, the size and if custom cuts are required. On average, tempered glass can cost anywhere from $10 to $35+ per square foot, depending on the size and thickness. Refer to our table below to see what common clear sheet sizes may cost you. Keep in mind that this glass can’t be cut and will have to always be ordered or purchased as a stock size. If you were to attempt to cut it, it would shatter into thousands of pieces due to the pressure. As for window panes, each pane can cost an average of $20 to $25 per pane. For instance, one member on OldHouseWeb.com said he was quoted $20 per glass pane, bringing the grand total to $1,200 for four windows with 15 panes. This was the quote for the glass only. A local company based in Garner, North Carolina, for example, sells tempered glass by the sheet. Their prices, according to the website, can range anywhere from $49 to $150 depending on the size. For example, a 4″ x 10″ sheet would cost $49, while a 42″ x 24″ sheet would cost $154. Home Depot lists the prices for skylights that use tempered glass, with prices ranging from $180 for a 22-1/2 in. x 46-1/2 inch window to as much as $1,200 for a Fakro Eletric Venting Skylight FVE 24/70. Tempered glass countertops, a popular grade for countertop material, can cost $75 to $115 per square foot to have a professional install. Something as simple as a shelf made from tempered glass could cost $30 to $40 for a 12″ x 24″ piece. The costs mentioned in our table above are for clear cuts only. If you were to want tinted tempered glass, then the costs could go up 10 to 15 percent. Additional costs will differ depending on the type of tempered glass you will buy. Since tempered glass can be bought to be installed in windows and other fixtures, the additional cost would involve paying for the installation of the glass. Installation costs will greatly depend on the size of the job and other factors. Customized cuts or colors can add to the price estimates mentioned above. Some companies may be able to remove the jagged edges for an additional fee as well. Tempered glass, according to Floyd Glass, is known to be the hardest types of glasses on the market. As noted above, it will break into smaller square pieces if it were to be smashed or someone came into contact with it. To create this glass, it will use a mix of chemicals and heat. The only downfall, when compared to other types of glass, are the edges, which are the weak point. Some state laws require frameless shower doors, windows 18 inches from the ground, windows above the shower/bathtub and glass within a certain distance to the door to use this type of glass. Customized cuts will cost a lot more than a standard factory cut. Consider purchasing a sheet direct from the factory rather than getting a customization. If hiring a professional to help with the installation process, consider using online services such as HomeAdvisor.com to help find the best quotes in your area. The website allows you to describe your quote and local licensed and reputable contractors will contact you with a quote.